Pearl Mantels features fine furniture quality, stunning details and classic designs that will enhance any decor. The Celeste shelf is made to please. Three design choices! The shelf comes to you with three separate design components consisting of the shelf, a pair of corbels and the arch. You will have the option of installing just the shelf, the shelf and the corbels together or the combination of the shelf, corbels and arch. 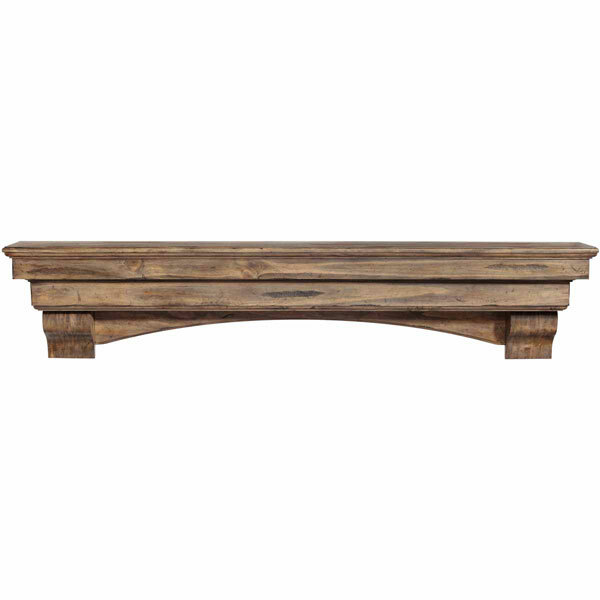 Hand crafted and pre-distressed from New Zealand Pine in our Dune finish, the Celeste shelf arrives with a warm organic earthy blend of soft colors with natural distressing lending warmth and comfort to any room. Hand-hewn edges and distressing enhance the natural beauty of the wood grain. Whether your design taste is clean, classic, traditional... the Celeste has your style covered. Use over the hearth, in the bedroom, bathroom, kitchen, den or anywhere you need a little something extra for storage or treasures. Its uses are only limited by your imagination. Mitered hanger boards are included for ease of hanging. Look for the pearl inlay that graces the right hand side of the shelf as proof that you have received an authentic Pearl Mantel.